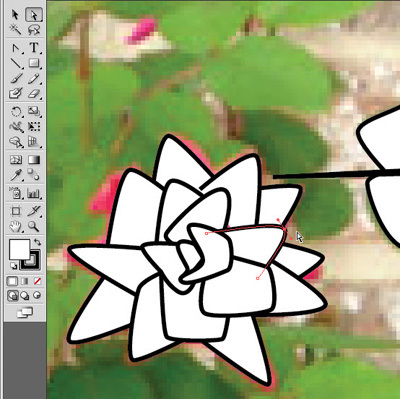 The Pen Tools are great ways to draw objects in Adobe Illustrator. There are actually a few types of pen tools with different jobs. To access the pen tool launch Adobe Illustrator and open a new page. Default page settings are just fine for this tutorial. By default the Tool Palette runs vertically up the left side of the window. If you don’t see the Tool Palette go into Window in the main navigation and select Tool Palette from drop down menu. The pen tool is towards the top of the Tool Palette with an icon that looks like an old fashioned ink pen. See the little tiny arrow on the bottom corner, this indicates there are additional options to this tool. Click and hold on the pen tool to see a drop down menu. You can move the mouse down over each item and select whichever pen tool you wish to use. Let’s go over each type of pen tool and explore what they do. The actual Pen Tool is the pen icon. This tool can be used for drawing. Click anywhere on the page to make a point, then click again for a second point and see the line form in between. Draw any shape by just clicking to create points and the line will fill in. Say for example you want to draw a square, the very last point you make will actually be clicking on the first point made. There will be a little circle as your mouse hovers over the first point to show you that will close the shape. The Add Anchor Point Tool looks like the pen icon, however it also has a little plus sign. This tool will add points to an existing line drawing. An example might be turning a triangle into a square. You could add a point to the triangle by clicking on a line. Notice the point created, next you could click on that point with the Direct Selection Tool and draw it out to form a square. This comes in handy when you need to fine tune a drawing. 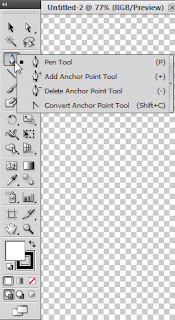 The Delete Anchor Point Tool looks like the pen icon, however it also has a little minus sign. This tool will delete points. Using the square example again, we can convert the square to a triangle by clicking on one of the points with the delete tool. The point and lines going to it will go away. The Convert Anchor Point Tool is a must use for drawing. It looks like an upside down V. If you have been making points and lines with the tools discussed you will notice everything has a sharp corner with distinct angles. What if we are drawing a more organic shape we need to round out our points. This tool does just that, click on any point with the Convert Anchor Point Tool and drag. You will see the shape round, and a tiny little handle bar form on each side of the point. With the Direct Selection Tool you can drag the little handle bars to get deep curves or slight curves. The Pen Tools can be great drawing tools just with themselves or combined with other tools. For example you can draw simple shapes with any of the Shape Tools and edit the points with Pen Tools to customize the shapes. This can be a quick way to knock out a digital drawing. Regardless of how you choose to use the Pen Tools after a little experimenting you can draw anything you wish in Adobe Illustrator.